Well, the packet’s sparkly. 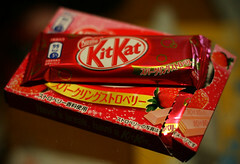 And the KitKat’s strawberry. 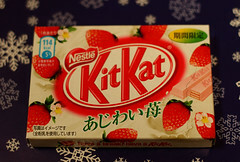 Another regional omiyage edition, this time from Yokohama – a very tasty strawberry cheesecake. Fairly cheesy but more yoghurty, and a very delicate fruit flavour. All the way from Tochigi prefecture, Tochiotome is a special breed of strawberry. They’re apparently far superior to common-or-garden strawberries, but I think you need to be a strawberry farmer to know the difference. 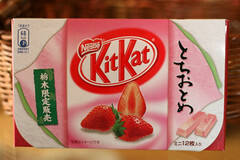 And to be able to tell the difference between strawberry KitKats… well that would be quite a feat. So what does Christmas time mean to you? To Nestlé, it apparently means strawberries. Every year, without fail, they wheel out strawberry flavour, sometimes several together. This year is no different of course. If you remember strawberry Nesquik (of course you do), well that’s what it smells of, but the taste, really, is nothing special. 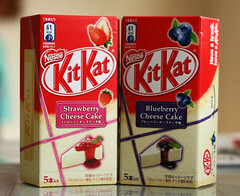 Of the strawberry and blueberry varieties. Smells of cheese, doesn’t much taste of cheesecake. And it’s overly sweet white chocolate. 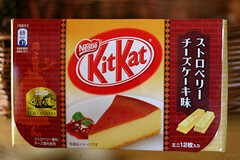 I’m never gonna get excited about a cheesecake KitKat until they bring back the Lemon. 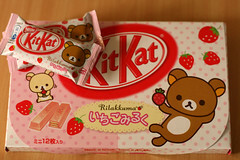 Yeah, we all like Strawberry, but the only thing different about this one is the box. 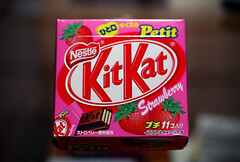 Really just for the completists, cos let’s face it, late November is considered Strawberry Time™ by some at Nestle Japan, so there’ll be a whole raft of Strawberry KitKats on the shelves soon, most likely.